Panasonic announced the immediate availability of its new 17 inch Panasonic BT-LH1700 HD Monitor. Building on its predecessor, the BT-LH1700W, the next-generation LH1710E offers enhanced image performance, excellent motion response and adds a wider range of production tools for advanced HD monitoring at an affordable cost. With a new 1280 x 768 In-Plane Switching (IPS) panel, the LH1710E incorporates the latest panel and image processing technology to deliver higher contrast, improved black level performance and more functionality. The monitor utilizes a newly-designed 10-bit image processing circuit that reproduces color with increased accuracy and detail and has a 3D look-up table (LUT) that calibrates the panel to reproduce accurate images according to the specific color standard selected. In addition to its superior image processing performance, the LH1710E offers a host of invaluable monitoring tools, including built-in waveform monitor and vectorscope that display all lines. Other display functions include pixel-to-pixel display, standard markers, blue-only and cross hatch overlay. Enhanced audio functions include built-in embedded audio support and display of up to eight channels of audio level meters (can be shown as 2-channel, 4-channel, 8-channel, or shut off completely). The monitor displays a variety of time code information ranging from Time Code (HD-SDI) LTC (Linear Time Code), VITC (Vertical Interval Time Code), LUB (User Bits among Linear Time Code), VUB (User Bits among Vertical Time Code). It has a wide 176Â° horizontal and vertical viewing angle. The LH1710E also has a Cine-gamma Film-Rec compensation function for compatible use with cameras such as the new AJ-HPX3700 and AJ-HPX2700 P2 HD VariCam camcorders and the tape-based AJ-HDC27 VariCam HD Cinema Camera. 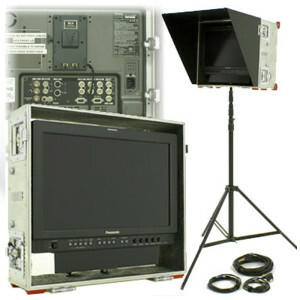 The versatile monitor comes with a wide range of professional inputs and outputs, include two auto-switching SDI (HD/SD) inputs (with switched output), DVI-D input, component, composite, RGB, audio and a headphone jack. Additional standard features include RS-232C and GPI remote control terminals, tally indicators (Red/ Green/ Amber) on the front panel, on-board stereo speakers, closed caption and five assignable function buttons for quick and easy access to features. The production-tough LH1710E has a durable, die-cast aluminum frame and operates without a cooling fan for noise-free performance. The low-power-consuming monitor runs on AC or DC power (12V) for added flexibility, comes standard with a desk stand and is VESA-mount compatible.